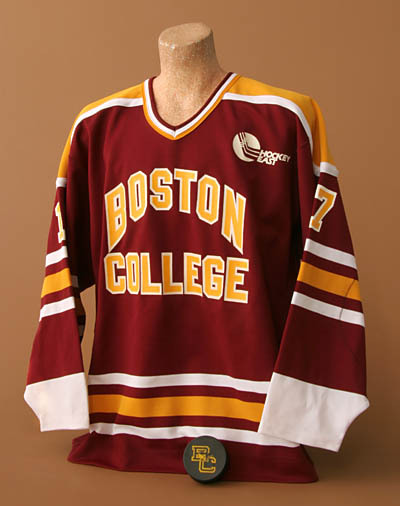 When he retired in 1992 after 34 years of coaching (14 at Clarkson, 20 at Boston College), Ceglarski was college hockey’s all-time winningest coach with a record of 673 victories, 339 defeats and 38 ties. An outstanding high school hockey player, Ceglarski went on to All-American honors at Boston College, NCAA champs his sophomore year. The Massachusetts native began his coaching career at Clarkson University in upstate New York (the Knights made it to the NCAA title game twice), and was a member of the U.S. squad that won a Silver Medal in the 1952 Olympics. In 1972, he returned to his Alma Mater as head coach and compiled only three losing seasons in 20 years. His 1986-87 team set a school record with 31 victories and only nine losses. Many Ceglarski-coached players went on to the pro ranks. He was elected to the U.S. Hockey Hall of Fame. His College Teams Won 673 Games in 34 Years! When Len Ceglarski concluded his 34-year hockey-coaching career in 1992, he retired with the most victories ever amassed in the history of the game on the college level. His teams at Clarkson University and Boston College won 673 games, lost only 339 and tied 38. In 34 seasons-14 at Clarkson, 20 at BC-Ceglarski-coached teams had only four losing campaigns. Ceglarski has been a tough competitor all his life. He started out as the youngest of eight children of Anthony and Stella Kowlicki Ceglarski, immigrants from Poland who first settled in Lynn, Mass. Ceglarski was a small but clever hockey player. He first learned how to stickhandle, then skate, then pass and then check. With these skills, shooting and scoring came easy. He was a scrapper in the corners and always came out with the puck. As a senior, Ceglarski led Walpole High to the Bay State Championship and then it was on to Boston College. 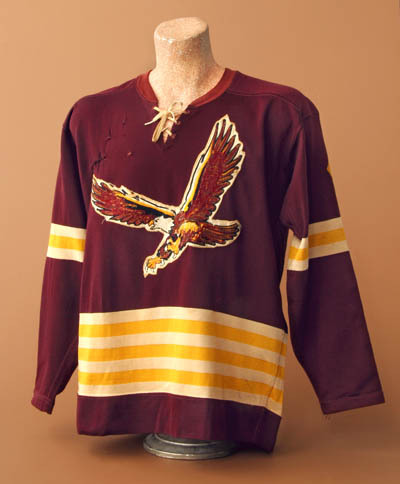 It didn’t take the little winger long to play an important role in another championship as BC captured the 1949 NCAA hockey title in his sophomore season. The following season (1949-50) the Eagles had another winning record and Len earned All-American honors. He was elected captain his senior season and concluded his collegiate career as the fourth leading scorer in Boston College history. Hockey wasn’t Ceglarski’s only sport. He played second base for the BC baseball squad and led all New England collegians with a .429 batting average in 1951. His career average for the Eagles was .374. 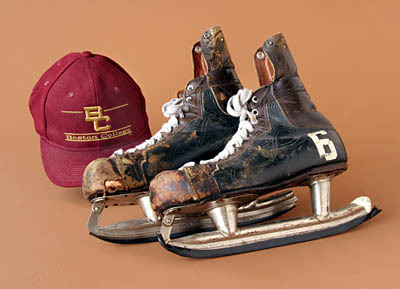 While serving as an officer in the United States Marines, Ceglarski was named to the U.S. Olympic hockey team that won a Silver Medal at Oslo in 1952. Ceglarski taught and coached at Walpole High for four years before being named head hockey coach at Clarkson, located in upstate New York, 150 miles north of Syracuse. It took Ceglarski only three years to guide the Knights to the NCAA championship game, only to lose to Michigan Tech, 7-1, in 1961. Five years later, Ceglarski’s Clarkson squad made it to the title game in the NCAA tourney, but again lost to a Michigan team – the Michigan State Spartans. When Snooks Kelley retired as BC coach in 1972, it was only natural for Len to return to his alma mater. And the rest is history. In 20 seasons at Chestnut Hill, his teams won scores of games and many championships. Unfortunately, Ceglarski’s charges never captured the NCAA title. His 1986-87 team set a school record with 31 victories and only nine losses. Many Ceglarski-coached players continued their careers as professionals in the National Hockey League. In 1992, he was inducted into the U.S. Hockey Hall of Fame. Len Ceglarski played on the United States Olympic Hockey Team in 1952 and the Americans almost brought home the Gold Medal from Oslo, Norway. “We finished with a 6-1-1 won-lost-tied record, but we didn’t win many fans because of our rough and tumble style of play,” Ceglarski recalled. In an 8-2 rout of the Swiss team, the USA players were involved in a brawl, which spilled over into the stands of the open-air rink. The next game was a downer, a 4-2 loss to Sweden that knocked the Americans from title contention. Ceglarski recalls that the U.S. beat Poland 5-3, in a game marred by several fights. He received a major penalty for belting a Pole behind the net, while two of his teammates were tossed out of the game for fighting. “Out with the Americans!” screamed a headline in the Oslo paper the next day.